Here at Kotaku, several of us have finally been wrapping up Assassin’s Creed Origins. That means we can get together to talk about it, spoilers and all. Kirk Hamilton: We’ve talked a lot about gameplay but this is a spoilercast, so we’re gonna spoil the story. Luke, you just wrote a really cool article about Bayek and Aya, and their marriage, and how the game focuses on that. What did you think of the story overall? Luke Plunkett: Yeah, so the reason I wrote that post was, the thing that I focused on and enjoyed out of the narrative of Assassin’s Creed Origins was that personal story. Because I thought the overarching story itself was maybe one of the most disastrously terrible [stories] in an Assassin’s Creed game like, ever. I know they’re not renowned for having great stories, the structure of these games doesn’t lend itself very well to a well-paced, zippy narrative, but even taking that into account, man, this game… it was difficult to follow, and difficult to really get into the larger story beats. Because they would just throw characters in and out and they wouldn’t develop characters, and they would just drop things on you that hadn’t been earned or explained. I enjoyed the personal moments, and the actual dialogue between characters. I thought Bayek and Aya’s marriage was a really beautiful thing that was represented in a video game. I thought that the way the Crocodile quest handled a similar tragedy to the one Bayek and Aya have been through was a real punch in the guts as well, that I think was handled really nicely. But those are the things I had to salvage out of a game that was sort of a wider wreck of a story. Kirk: In a cutscene! Ptolemy is killed off-camera at the end of a cutscene, I should point out. I thought that was pretty disappointing. Kirk: So wait, you’re gonna say that there was a good story after you’ve just run down this huge list of confusing bad guys? Stephen: Yes, because part of the fun of Assassin’s Creed is the cameos of all these sorts of historical figures. They’re rooted in the fact that some of these events did happen. That Cleopatra was a historical figure. That Caesar rose to power, and he was assassinated, all this kind of stuff. And so they’re getting to those, and yes, it’s a different pace than the rest of the game, but a lot of that is self-directed. I played the game super slowly. I had my set of contracts for people that I was supposed to kill. I took my time in that really cool city that’s being re-excavated from the sand, and I found the assassination of that guy (The Scarab) really dissatisfying. I found a lot of the main assassinations really anticlimactic. But I really enjoyed how the story would build for each one, how you’d understand the situation of each region, and why the people were angry at a certain person, and how you would identify them and all that. And I always had in my mind that Ptolemy was the big bad guy. And I did find it clunky that he isn’t the final showdown of the game. But it made sense to me, given that the Romans are an invading imperialistic force that are sort of stepping all over Egyptian culture, that Caesar would sort of step all over the rest of the game. I felt there was some unevenness with how much time we spent with Aya versus how much time we spent with Bayek, and that that was a bit of the inelegance of the storytelling. But in terms of the historical tour, and the fact that it accelerated toward the end, I’m okay with that. And I even think that if you slow down after the Ptolemy bits and the Romans really come to the fore, you can just mess around in that northwest region for a while, and really delay that final section of the game where you go as Aya to Rome. And in that regard, you can go back to a more chill pace and just feel like you’re Bayek, dealing with a Roman presence. Kirk: Now that I’ve played through it twice, and I’ve paid much closer attention to the story and who’s who and what’s going on, I gotta say, it just bears the signs of AAA development and of writing a AAA game. It just really feels in that second half as though they had so much to tie together, and so many things to relate back to these main characters, that it just wasn’t possible. There are a lot of things, going through it again, where, I was paying close attention, I knew who people were, and it wasn’t just the villains [who got jumbled]. When they say Flavius is the main bad guy, and Bayek says, “Flavius!” And he’s so mad, like we’re supposed to know who this guy is. Kirk: That is great, and that story [of Bayek and Aya’s marriage] is really good. But I feel like they were building up a thing with Cleopatra that would’ve been really good, and I’m curious if that’s gonna factor [down the road]. Cleopatra died [in actuality], she killed herself I guess, but someone smuggled in asps, and that was how she died? And I feel like there’s enough there that already feels like an Assassin’s Creed game. Playing through it again, and knowing how everything plays out, it r [for them to do something with it.] It really feels like they’re setting up Aya to kill Cleopatra. She ends the story by saying to Cleopatra, if you get in my way I’ll kill you, the age of the Pharaohs is over. And that, to me, felt like that made sense. If Cleopatra turned on them, that’s where the story felt like it was going anyways. But it just didn’t play out that way, and instead we get these Roman guys that Cleopatra has allied herself with temporarily. And they’re actually responsible for killing Khemu? But then also, Bayek killed his own son! I mean I know he “didn’t,” he was set up and he was pushed into doing it, but that did happen, in the beginning. I thought that that would wind up being this interesting thing they could say about this guy who, as much as he’s a likable dude, does go on this ridiculous murder spree throughout all of Egypt and kills thousands of people. This whole thing started because he killed his own son, whether or not by accident. That didn’t come back. And there’s also, you come back and your friend [Hepzibah] in Siwa is dead, and you get his flaming sword. The whole thing is played up like it’s a big deal, but the story didn’t return to that guy at all since, you know, 30 hours ago, so you don’t remember him. There are a lot of those clumsy things, like, “Okay, we’re gonna force these two pieces back together and make it hold together,” that sort of bugged me. Luke: I feel like the story’s too big. Kirk: Yeah. The whole game is too big, really. Luke: Yeah, which is what I was leading to, that the whole game is too big, really. We just spoke about having whole branches of the [upgrade tree] that we never even investigated. The story falls over itself because it reaches so far, and just can’t tie everything together again. I managed to finish the game and there are whole regions that I haven’t visited yet that are still obscured. It could’ve actually been a smaller game, it could’ve been a little bit more focused than trying to reach as far as it did in terms of its scale of the narrative, which it doesn’t really succeed in doing. 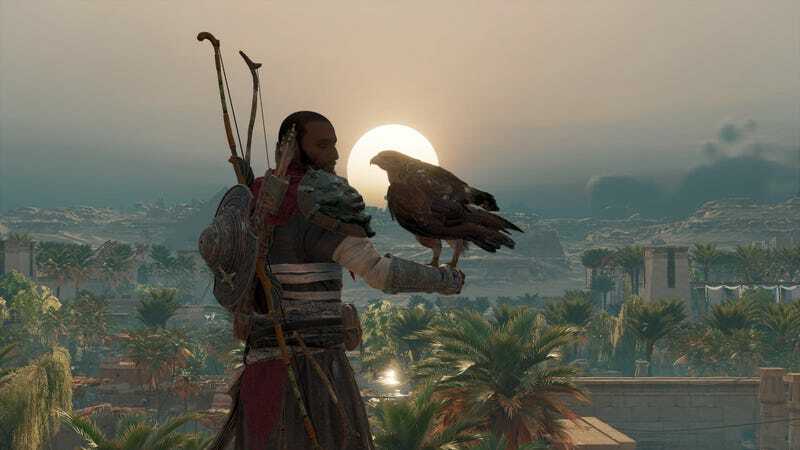 After that, Stephen goes long on the challenges with open-world storytelling, we talk some about the much-maligned future storyline part of the Assassin’s Creed universe, as well as whether or not we want to the next few games in the series to also star Bayek and Amunet. Listen to the full episode for all that and more.